LIGHTWEIGHT, SUPER ABSORBENT and QUICK DRYING - Microfibre holds substantially more water than bulkier Cotton, air it dries super quick, and is naturally antibacterial. The material works to quickly pull water away from the coat and holds up to 8X its own weight in water, and 4X more water than cotton. KEEPS YOUR FRIEND WARM and COSEY - After a bath or walk in the rain. Fantastic when used with the Arcadian Microfibre Dog Towel. EASY to USE and FASTEN SECURELY - Simply wrap around and fasten the adjustable clip under your dog's belly. The Neck also has an adjustable tie. COMFORTABLE AND NON RESTRICTIVE - No restrictive under belly fabric or uncomfortable tail straps. PREMIUM QUALITY MICROFIBRE - So it's extremely durable, and will therefore perform better and last longer. This luxury robe is super soft on your beloved pet. Due to the high quality of this particular microfiber, this Robe can be machine washed AND tumble dried on low, meaning that you can focus on keeping your pet clean, without worrying about the towel! 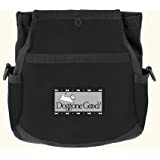 MULTIPLE STORAGE OPTIONS: In addition to the main storage compartment with drawstring closure, this training bag also features 2 additional lined storage pockets secured with zippers. 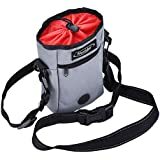 ADJUSTABLE BELT: This premium treat bag comes complete with an adjustable belt, which simply clips onto either the rear or side D-Rings depending on your preference. Leaving your hands free to handle your dog whilst keeping your pockets clean. The belt may also be worn as a shoulder strap if desired. 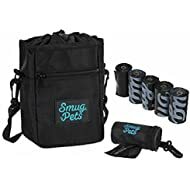 INTEGRATED POOP BAG DISPENSER: Never forget your bags again with the integrated poop bag dispensing port, which is suitable for all standard size rolls of poop bags. ADDITIONAL D-RINGS: We have included 2 extra D-Rings on the side of bag, both of which are ideal for hanging any extra attachments which you may desire such as clickers, whistles, training aids etc. DRAWSTRING OPENER/CLOSURE: For easy access when your hands are wet and cold. 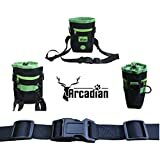 Conveniently store all of your treats whilst walking and training your Dog. Secure zipper compartments are ideal for personal items such as keys, coins and phone. 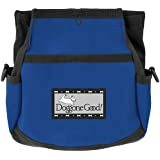 Perfect for both Canine professionals and Pet Dog owners alike.